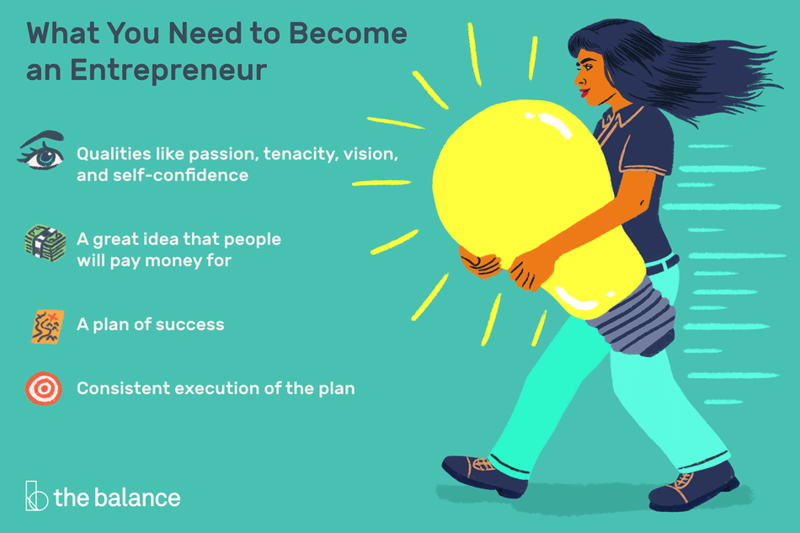 Interestingly enough, there is debate over the definition of an entrepreneur. Some experts have a wide definition to include anyone who works for himself. Others have a narrower view point, suggesting that an entrepreneur doesn't just work independently but also, his business involves innovation and leadership. What they do agree on is that an entrepreneur takes an idea, develops a business around it, manages the business, and assumes the risk for its success. Small business: This includes mom and pop shops and local business owners. Small business can include partnerships, sole proprietors, and LLCs. Generally it's any business that has less than 500 employees, according to the Small Business Administration. Home-Based Business: A home based business could fit under the category of small business, but the primary factor in this case is that it's run from home, as opposed to an office or other location. But just because a business is run from home, doesn't mean it can't compete with larger businesses. In fact, many large corporations were started from a home, including Apple and Disney. Online Business: Internet-based business can be small, home-based, or even large corporations. The key difference here is that the business is operated primarily online. This includes companies like Amazon or other e-commerce businesses, bloggers, Ebay and Etsy owners, and any other business that does the majority of its business online. Inventors: For an inventor to be considered an entrepreneur, he needs to go beyond the idea stage to build the product and get it to market. A good example of inventors that transition to entrepreneurs are the contestants on Shark Tank. Serial Entrepreneur: Many entrepreneurs get the most joy out of starting and building a business, but not in its continued management, so they sell it to launch a new idea. They are still considered entrepreneurs because they operate and assume risk in the business for the time they own it. Other times, serial entrepreneurs juggle several businesses at once, earning multiple streams of income. Lifestyle Entrepreneur: Although the idea of lifestyle entrepreneur isn't new, it's gained in popularity with the rise of technology, the Internet, and a global economy. A lifestyle entrepreneur is one that builds a business that incorporates their interests and passions, and sustains their life goals. Many in this category are referred to as digital nomads because they often have online businesses that allow them to travel. However travel isn't necessary to be lifestyle entrepreneur. The key factor in a lifestyle entrepreneur is that they do what they love, and/or the business supports their chosen lifestyle. Passion - Talk to successful entrepreneurs and you'll nearly always hear the word passion when they describe what they do. Following your passion is one of the best predictors of success. Independent thinking - Entrepreneurs often think outside the box and aren't swayed by others who might question their ideas. Optimism - It's difficult to succeed at anything if you don't believe in a good outcome. Entrepreneurs are dreamers and believe their ideas are possible, even when they seem unattainable. Self-confidence - This is not to say entrepreneurs never have self-doubt, but they're able to overcome it, and believe they can achieve their goal. Resourceful and problem solvers - Lack of assets, knowledge, and resources are common, but entrepreneurs are able to get what they need or figure out how to use what they've got in order to reach their business goals.They never let problems and challenges get in the way, and instead find ways to achieve success despite hardships. Tenacity and ability to overcome hardship - Entrepreneurs don't quit at the first, second or even hundredth obstacle. For them, failure is not an option, so they continue to work toward success, even when things go wrong. Vision - Some of the more stringent definitions of entrepreneurship include vision as a necessary element. It helps to know your end goal when you start. Further, vision is the fuel that propels you forward toward your goal. Focus - It's easy in this fast paced, constant info-in-your-face world to get distracted. This is especially true for business start-ups that often get side-tracked by the shiny object syndrome (i.e. products and services that promise fast results), or bogged down in unimportant busy work. Successful entrepreneurs are focused on what will bring results. Action oriented - Entrepreneurs don't expect something from nothing and they don't wait for things to happen. They are doers. They overcome challenges and avoid procrastination. One of the great things about becoming an entrepreneur is that anyone can do it. Steve Jobs, Bill Gates, and Mark Zuckerberg were in college when they started Apple, Microsoft and Facebook respectively. Ree Drummond, The Pioneer Woman, started a blog for fun, which has since turned into a business, a TV show and books. While it takes research, planning and work, you can start a home business in a month, maybe even faster depending on the business.